Delta state governor, Dr. Emmanuel Uduaghan has appealed to church leaders in the state to ensure that their followers do not engage in the acts of retaliation in the face of current security challenges posed by Boko Haram’s insurgency against the Nigerian nation, especially resident Christian communities in the North. He said this at a meeting with church leaders in Asaba where he warned against any act that could lead to inter-religious crisis and become an embarrassment to the state. He explained that the federal government was already on top of the security challenges facing the nation and promised that the strategies mapped out would restore confidence and guarantee the safety of lives and property in the country. According to him, “Please appeal to your followers not to take the laws into their hands as we must not allow this issue to get to the extent of reprisal” and thanked Christian leaders for helping to douse tension through their utterances. While regretting that religious crisis breeds suspicion urged them to pray fervently for improved relationship between Christians and Muslims so that together they should preach love and the brotherhood of man. He promised to strengthen community policing involving various Community Development Associations (CDAs) that will provide intelligence report to the police, adding that community policing was hinged on “neighbour to neighbour knowledge were members of the vigilante group would monitor the activities of their people and check any unwholesome act through intelligence report to the police”. The governor who also gave details of other security measures that would be used to track criminals said plans were under way to procure sophisticated infrastructure that would be used to sniff and pick-comb minute details of the activities of criminals in the state. “We are going to acquire more security infrastructure for the police to update intelligence gathering process in the state”. “We should know our people and the type of job that they do. We have those whose means of livelihood are genuine and those whose life styles are questionable. Some of them sleep during the day and move in the night. We would track them”, he vowed. 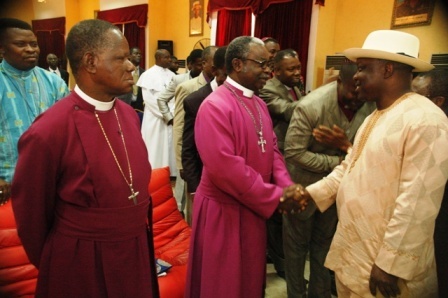 The chairman of Christian Association of Nigeria (CAN) in Delta State, Bishop Goddowell Awomakpa promised that the clergy would cooperate with the state government to ensure harmonious relationship with their Muslims brothers in the state. Bishop Awomakpa also promised that they would continue to pray for peace so that the policies and programmes of the state government would be religiously executed.